So, here we have an addition to the Bling series of Micromax mobile phones after a long time. 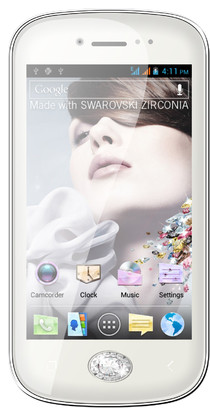 This phone has been named as Bling 3 A86 and this has been powered with Android 4.1. After average performance by Canvas 4 in the market Micromax is working hard to get the good phones in the market with better hardware and software options. Now we know that phones in the Bling series are more about their design and that Swarovski Diamond fitting in the phone rather than their hardware specifications but in this case both have been taken care of. With the screen size of 4 Inches and the qHD resolution this phone has Dual Core Processor which has been clocked at the frequency of 1 GHz. Now the display and the processor power is decent. The primary camera of this device is of 5MP with the Flash support and that of the secondary camera is 0.3 MP. The battery strength of this device is 1600 mAh and it can provide you with the talktime of 4 hours on 2G and 200 hours of Stand-By time. Now as we have talked earlier that this phone is available with the Jelly bean Android 4.1 (which is the oldest version of Jellybean available) but it is still decent especially when most of the devices have Ice Cream Sandwich with Dual Core Processor. The internet memory capacity of the device is somewhat near to 512 MB which can be taken up to 32GB with the help of microSD card. This is a Dual SIM device supporting GSM Bands on both the slots and as of now it can be seen on Flipkart for a price of 9,599 INR.